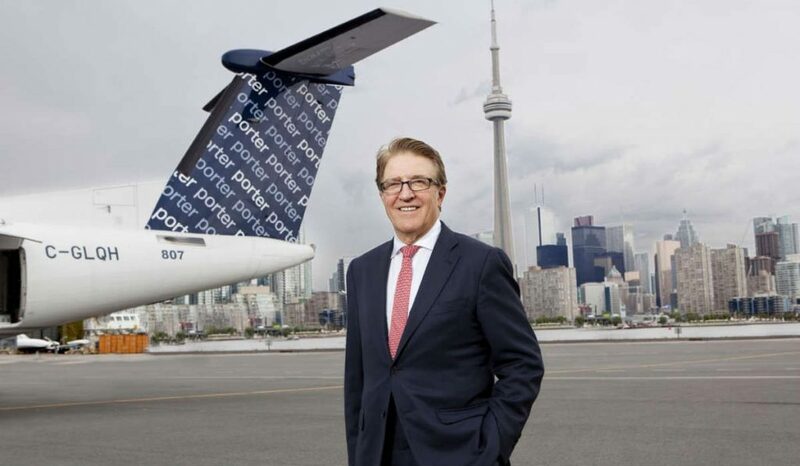 Robert Deluce, president and CEO of Porter Aviation Holdings Inc. and Porter Airlines Inc., was one of four leaders inducted into the Canadian Business Hall of Fame. He was joined by George Cope, president and CEO of BCE Inc. and Bell Canada; Monique Leroux, chair of the board of Investissement Quebec, vice-chairman of Fiera Holdings Inc., and former president of Desjardins Group; and and Ian Telfer, chairman of Goldcorp. The four business leaders were officially inducted as Companions of the Order of the Business Hall of Fame, by Chancellor David Denison, on May 17 during the 40th annual induction ceremony and gala dinner with more than 1,000 guests. There are now more than 170 Order of the Business Hall of Fame Companions featured in a display in the Allen Lambert Galleria located at Brookfield Place in Toronto, Ontario. Deluce is also a member of Canada’s Aviation Hall of Fame and, explains Porter, he is part of a decades-long Canadian aviation legacy that began when his parents started White River Air Services Limited in 1951. He has also been involved with norOntair, Austin Airways, Air Creebec, Air Ontario, Air Manitoba, Air Alliance and Canada 3000 Airlines. As Porter’s founding president and CEO, Deluce is responsible for overseeing the airline’s strategy, finances, commercial objectives and operational performance. He has also been recognized as the E&Y Ontario Emerging Entrepreneur of the Year, the Canadian Marketing Association Marketer of the Year, and the Canadian Venture Capital and Private Equity Association Entrepreneur of the Year. In 2012, he was presented with the Queen Elizabeth II Diamond Jubilee Medal for his significant contribution and achievement to Canadians. Since its inception in 1979, the Order of the Business Hall of Fame has been the highest honour of its kind in Canadian business. Each year, business leaders are nominated by their peers and chosen by an independent selection committee representing Canada’s foremost business and academic institutions. The process is managed in its entirety by Lee Hecht Harrison Knightsbridge, the National Partner of the Canadian Business Hall of Fame.